This is the logo for recipients of the Empire Development tax credits. 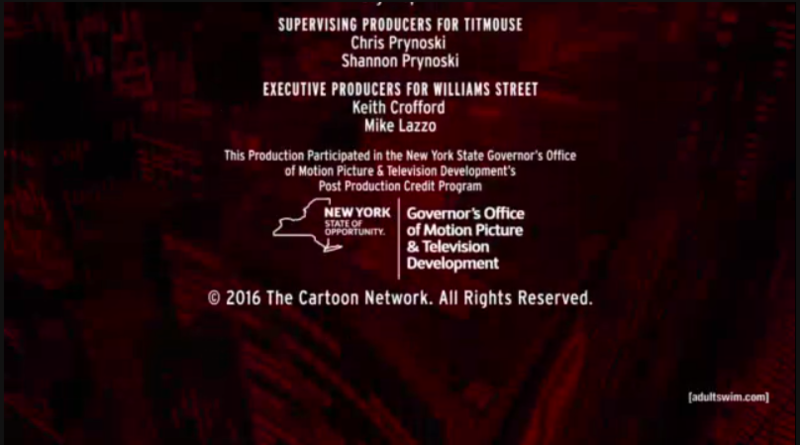 The Venture Brothers is just one of the many TV shows produced in New York, likely for some of our juicy film credits. The program known as Governor’s Office for Motion Picture & Television Development is part of the Empire State Development program. Empire State Development is an organization tasked with handing out tax credits and exemptions within the state of New York. The logo you see at the end of the credits indicates that the show received some of these incentives. You might be wondering, what is the reason for this program? Well, a few years back, I attended the Empire State Development annual meeting where they announced that they would shift the majority of tax credits to this exact program. All of the smaller counties in attendance were a bit upset. In general, this program only helps New York City. (On occasion scenes will be filmed in other cities, Spiderman had a shot filmed in Rochester, NY and all of Bruce Almighty was filmed in Buffalo, NY, but it’s more common to see production in NYC.) The intent behind these tax incentives hinges on the idea that the economy of New York is stimulated in the short term by purchases made during production and in the long term by tourism dollars spent as people visit NY. There may be some truth to the theory that people visit places they are familiar with from TV and movies. The influx of spending on these credits may be the reason for our increased tourism rates in NYC over the past decade. Getting back to the Venture Brothers, there are a few different tax credits they could be taking part in for this program. The only one mentioned in the credits is the 10% tax credit from post production. In essence, the state government gave them a 10% discount on all qualifying post-production costs. Not bad, but the important thing here is that if you’re a taxpayer in New York State you can take at least a little credit for the continued development of Venture Brothers! You paid for part of it after all. This is pretty interesting and brings up an even more interesting point. Shouldn’t NYS residents get to watch the show for free then? They already paid for it. Instead of needing to log into AT&T, Comcast, DirectTV, or some other service to view the streaming episodes of Venture Brothers on Adult Swim shouldn’t you be able to watch them for free in New York State like you can watch PBS for free in the United States and BBC free in the UK? I want to watch Venture Bros without having to pirate it damn it! Great point. I’m not really sure if that works the same way though. It’s only partly paid for (less than 10%) by taxpayers. Maybe they could do a thank you message instead of running ads for New York residents? I don’t think they should have to do anything in particular, but it would be cool if they recognized the contribution of tax dollars somehow. Ok I suppose that’s a fair point. I wonder how much 10% of production costs is and how much they make from ads. I LOVE the monarch and I’m just glad the storyline is focused on him now regardless of who’s paying for it! If we give them some more tax money can they keep making episodes??? i don’t care who funds it i just want more episodes!